INDUSTRY.co.id - Jakarta - Allianz Indonesia officially confirmed the change of name Ocean Ecopark in Ancol Dreamland Park, Jakarta became Allianz Ecopark. Allianz Indonesia continues to commit to improving the quality of life of Indonesians through a variety of health-related efforts, including by presenting various supportive programs and facilities. "As one of the insurance protection providers of various risks in the aspects of life, Allianz Indonesia has always been consistent in promoting the importance of health, both to customers and the wider community. The presence of Allianz Ecopark is a proof of Allianz's support for the availability of infrastructure that can be used by families to exercise and engage in green open space, "said Meylindawati, Director of Allianz Life Indonesia through an official statement received by INDUSTRY.co.id (Tuesday, 25/7/2017). Allianz Ecopark is the perfect location to show Allianz's commitment because it has a green open space area with nature sport edutainment concept. Green open space can be utilized by the community to conduct a variety of outdoor activities related to health and the environment, both individually and with colleagues and family. Allianz Ecopark also provides several zones with different functions and facilities such as zones for running, walking to cycling. And there is a zone of flora and fauna that can be utilized for educational facilities of children while berekreasi. The Allianz Ecopark area can also become an environmental laboratory by observing wildlife living in this green area. "Ancol as one of the largest tourist destinations is in Jakarta that provides a green open area begandengan hands with private parties to jointly raise this area to be more useful for the wider community. It is very appropriate that we work together with Allianz Indonesia which has the same mission, which is the campaign of the importance of health, so that the existence of Allianz Ecopark can become the capital's lungs that provide fresh air" said C. Paul Tehusijarana, President Director of Taman Impian Jaya Ancol. Allianz's contribution to society globally is manifested by establishing the Allianz's big names in some of the major sports stadiums in the world. Allianz Ecopark will join the Allianz Allianz Arena family in Allianz Arena in Munich, Allianz Stadium in Sydney, Allianz Park in London, Allianz Riviera in Nice, Allianz Parquedi Sao Paulo, and Allianz Stadiondi Viennadan Allianz Stadium in Turin. "Allianz's partnership with Taman Impian Jaya Ancol for Allianz Ecopark's naming rights will be an excellent collaboration, where Allianz's brand as a provider of insurance protection will be more remembered by the people of Indonesia, supported by infrastructure facilities in one of the largest and strategically located recreation parks in Ancol , Jakarta. 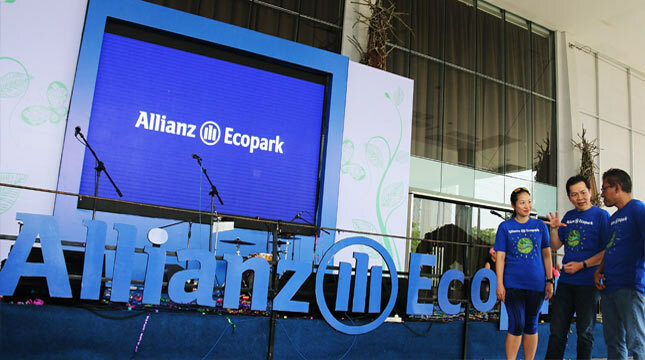 Allianz Ecopark will certainly bring more variety of activities that support the creation of a better quality of community life," said Karin Zulkarnaen, Head of Market Management of Allianz Indonesia. Allianz has become a brand that is attached to its image as a pioneer of a healthy lifestyle through a wide range of sponsored and sponsored sports initiatives. Over the last few years Allianz's efforts to support the creation of quality living for the people of Indonesia are conducted through various programs and activities, including Allianz Junior Football Camp, Allianz Jakarta Heart Run, Allianz Virtual Run, Allianz World Run and today officially confirmed at Allianz Ecopark.